Up until recently, attenuators were tested using criteria listed in the National Cooperative Highway Research Program Report 350 (NCHRP 350), “Recommended Procedures for the Safety Performance Evaluation of Highway Features”. In 2016, a plan to replace these testing criteria and guidelines was set in place when the Association of State Highway and Transportation Officials (AASHTO) released the MASH guidelines. Here is everything you need to know about MASH testing and how it will impact the attenuators you use in your fleet. AASHTO’s Manual for Assessing Safety Hardware (MASH) was released in the Spring of 2016 and is considered an updated replacement of the NCHRP Report 350. At a high level, AASHTO defines MASH as presenting, “uniform guidelines for crash testing permanent and temporary highway safety features and recommends evaluation criteria to assess test results.” Not only does it further expand on the testing requirements listed in the NCHRP Report 350, but it also offers guidelines for when MASH tested and approved attenuators must be used on your TMA trucks. What are the major changes from NCHRP Report 350? In comparison to NCHRP Report 350, there are several major changes that make MASH testing stricter and more difficult for attenuators to pass and be deemed safe for highway use. To explain the differences in the two reports, we must first examine what tests where required in the NCHRP Report 350. 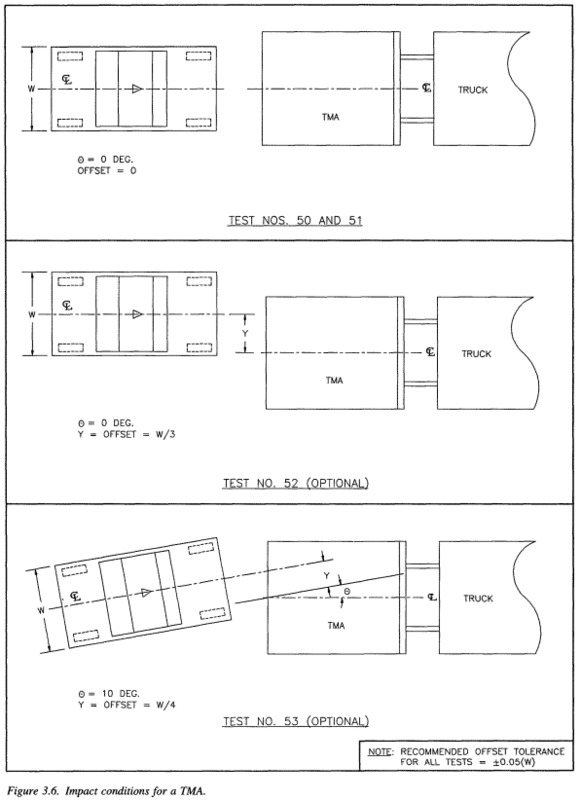 Testing criteria and conditions for truck mounted attenuators as described in the NCHRP Report 350. The first mandatory test done in Test Level 2, Test 50, was set to, “to evaluate risks to occupants of a small car impacting the TMA.” In this test, an 820C vehicle weighing in at 1,800 pounds directly struck the TMA traveling at 70 kilometers per hour (km/h), or approximately 43.5 miles per hour (mph). The next test performed, Test 51, represented the exact same situation with the only difference being the 820C vehicle being replace with a pickup truck, referred to as a 2000P, weighing in at 4,400 pounds. Both of these tests involved the 2000P pickup truck crashing into the TMA, with the only difference being the location of where they crashed. Test 52 had the pickup truck running into the truck mounted attenuator offset from the center of the attenuator, while Test 53 had the pickup truck hitting the center of the truck mounted attenuator at a 10-degree angle. 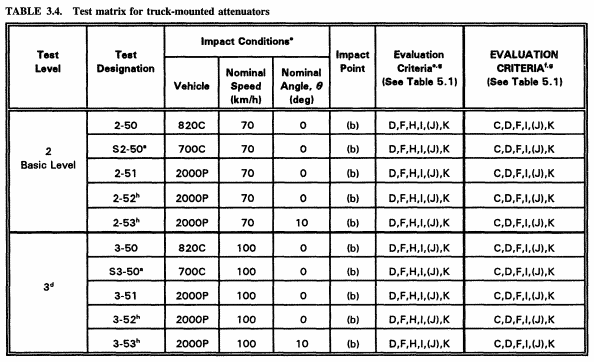 With all the tests listed above being categorized as Test Level 2 tests, otherwise known as the basic level, the report also ran the same tests under Test Level 3, with the only difference being the impacting vehicle’s speed being increased from 70 km/h to 100 km/h, or approximately 62 mph. At the time these testing guidelines were created in 1993, these tests were up to standard in determining the effectiveness of truck mounted attenuators. As you will see though, these tests have become significantly outdated over time. Now that we know what exactly the NCHRP 350 tests for truck mounted attenuators entailed, we can examine the changes that the MASH testing made. The first major change made was to the weight of the impacting vehicles, both the 820C (small car) and the 2000P (pickup truck). The weight of the 820C vehicle has been increased to a 1100C vehicle, now weighing 2,420 pounds. Additionally, the 2000P vehicle has been increased to a 2270P vehicle, weighing in at 5,000 pounds. These changes were made to reflect the increased weight of new passenger vehicles on the market today compared to when the tests were originally created. With the evaluation criteria remaining the same, a heavier impact vehicle makes passing the tests a much more difficult task. The next major change that was made to the NCHRP Report 350 in the MASH tests was now requiring Tests 52 and 53 to be completed. In a real-life situation, very rarely does a vehicle crash into the attenuator on a TMA truck perfectly centered and straight. More often, the driver of the errant vehicle will try to veer out of the way in order to avoid the crash, making the contact with the attenuator off-center and at an angle. By making Tests 52 and 53 mandatory, the attenuator is better tested to mimic real life scenarios it will face. 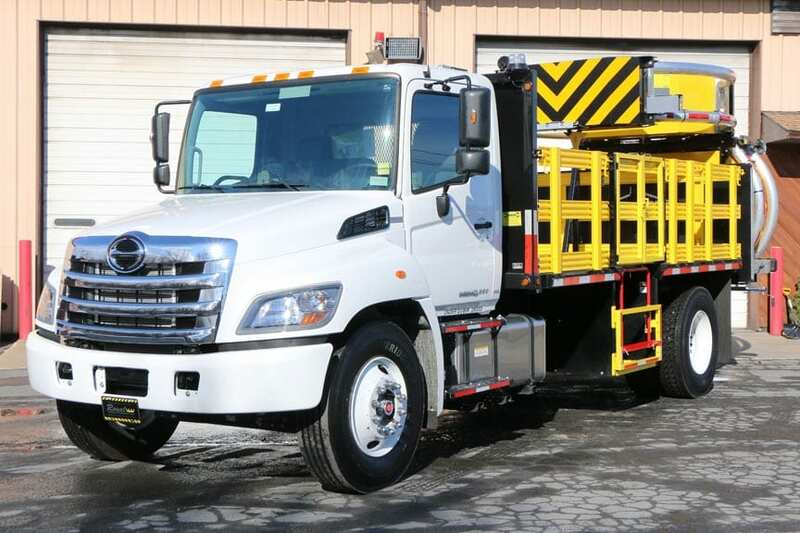 Ultimately, the testing changes made in the MASH tests were done with the purpose of ensuring that truck mounted attenuators currently on the market can stand up to real-life crash scenarios that they will frequently face in today’s work zones. With a worker’s safety being the number one priority, MASH approval for a TMA is a clear sign that the unit is safe to be in your work zone. What attenuators are currently MASH tested and approved? As of March 2019, there are only two truck mounted attenuators that have been MASH tested and approved in accordance with the 2016 edition of the MASH guidelines. The two truck mounted attenuators currently approved are TrafFix Devices’ Scorpion II TMA (as of June 15, 2017) and Verdegro’s Blade TMA (as of July 7, 2017). For a complete up-to-date listing of all approved attenuators, you can visit the Federal Highway Administration’s website which lists all the currently approved attenuators. While MASH approved attenuators will soon be required on your trucks, we recommend, as best practice, that you upgrade the attenuators on the trucks in your fleet as soon as possible, regardless if it is before the sunset date or not. Why do we recommend this? Because they have been proven to be safer! The testing parameters and judging criteria as described in the 2016 edition of MASH represents not only the latest tests but also the most challenging ones to pass. Attenuators that have been MASH tested and approved have passed the strictest of standards, and thus, should be utilized on your TMA trucks before they are even required to ensure your work zones are as safe as they possibly can be. When is the sunset date? With all the new guidelines in place, one obvious question that arises is when you need to officially begin using MASH tested and approved attenuators on your trucks. While this may seem like a clear cut date, diving deeper into this reveals the answer to when you must begin using MASH tested and approved attenuators is a more complex answer. While AASHTO’s guidelines state any attenuator manufactured after December 31st, 2019 must meet the new testing requirements, each individual state can set their own deadline in terms of when they are choosing to enforce this. Similar to many other regulations surrounding TMA trucks, states can create their own regulations. In practice, what this means is that while AASHTO’s guidelines have a sunset date of December 31st, 2019, each individual state may choose to have a sunset date either before or after this deadline. So how do you know what date your state is choosing as the sunset date for requiring MASH tested and approved attenuators? Leave a comment below and a member of Royal’s team will answer any questions you may have! While this sunset date represents when TMA trucks need to start being built with MASH tested and approved attenuators, this does not mean that all the attenuators currently on the trucks on your fleet become useless after this date. In a January 7, 2016 memorandum published by the Federal Highway Administration with the subject of “INFORMATION: AASHTO/FHWA Joint Implementation Agreement for Manual for Assessing Safety Hardware (MASH)”, the process by which attenuators can be grandfathered in is laid out. Simply, truck mounted attenuators manufactured on or before December 31st, 2019 that have passed the testing criteria as described in the NCHRP Report 350 or the 2009 edition of MASH, “may continue to be used throughout their normal service lives.” Essentially, a non-MASH approved attenuator may be continued to be used on TMA truck after the sunset date until it is damaged beyond repair in a crash. As previously stated though, it is best practice to utilize MASH tested and approved attenuators in your fleet as soon as possible as they represent an increase in safety over their non-MASH approved counterparts. What happens if your truck gets damaged after the sunset date? The next logical question that arises is that if the attenuator on your TMA truck is grandfathered in and is crashed into in 2020, do you need to replace it with an entirely new MASH approved attenuator? Naturally, as a crash in a work zone happens once every approximately 5 minutes in the United States, this situation will frequently arise once we are past the sunset date. The answer to this question is actually quite simple in that it entirely depends on how severe the attenuator is damaged. Ultimately, if the attenuator is deemed to be damaged beyond repair after the December 31st, 2019 deadline, it must be replaced with an attenuator that is MASH tested and approved. Many attenuators are built as modular units, meaning that if the crash is not severe, only the damaged parts need to be replaced. In crashes past the sunset date, these parts on grandfathered attenuators are permitted to be replaced with non-MASH approved parts. How do you know whether an attenuator is beyond repair? In the event of a crash, you should take your truck to a certified attenuator repair facility, who can make that determination for you! For more information about post-crash protocol, watch our episode of TMA Trucks A to Z below detailing the entire process! In this episode of our TMA Trucks A to Z series, we discuss exactly what you need to do following an increasingly likely crash into one of your TMA trucks. While it may seem like an intimidating change, ultimately, the changes made to attenuator testing as described in the 2016 edition of the AASHTO Manual for Assessing Safety Hardware (MASH) have been set to ensure your attenuators are as safe and effective as possible. With a crash in a work zone happening once every 5.4 minutes in America in 2015, attenuators need to be built to safety prevent the inevitable errantly driving vehicle from causing damage in your work zone. MASH testing ensures just this, as its stringent testing requirements closely resemble the types of crashes that will happen in real life work zones. Do you still have questions about MASH testing or deadlines that need to be met? We understand! By sending us an email at info@royaltruckequip.com, a member of Royal’s team will be in contact with you to answer any questions you may have.